Maya was adopted from Happy Life Animal Rescue in 2017. Over the past two years, unbeknownst to Happy Life, she was bounced around from home to home, each living situation making her more uncomfortable. After being contacted by her most recent "adopter", Happy Life stepped up to take Maya back in hopes of helping her find her true, forever home. Maya is approximately two years old and is a lab mix. She would do best in a home as the only dog and with older children. 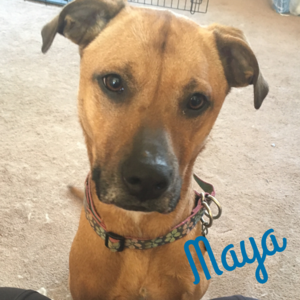 Maya was not at fault for her sad story and we hope that she can find someone who will love her unconditionally and provide her with the only home she will ever need!